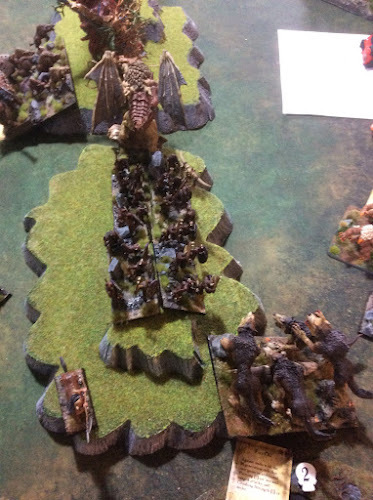 One Beast of Nature and the two Herders went in and hit the Stampede. They inflicted wounds on it but it held. Talonriders and other BoN targeted Brutox wounding it. 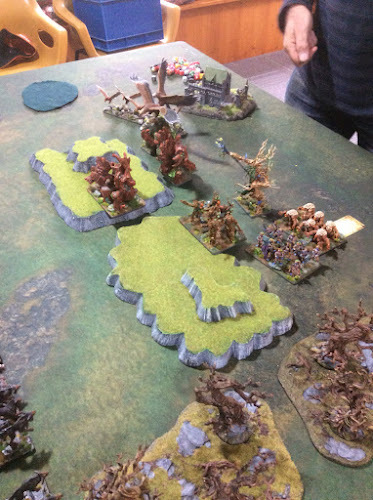 The second unit of Shambler removed the Beast Pack in the centre. 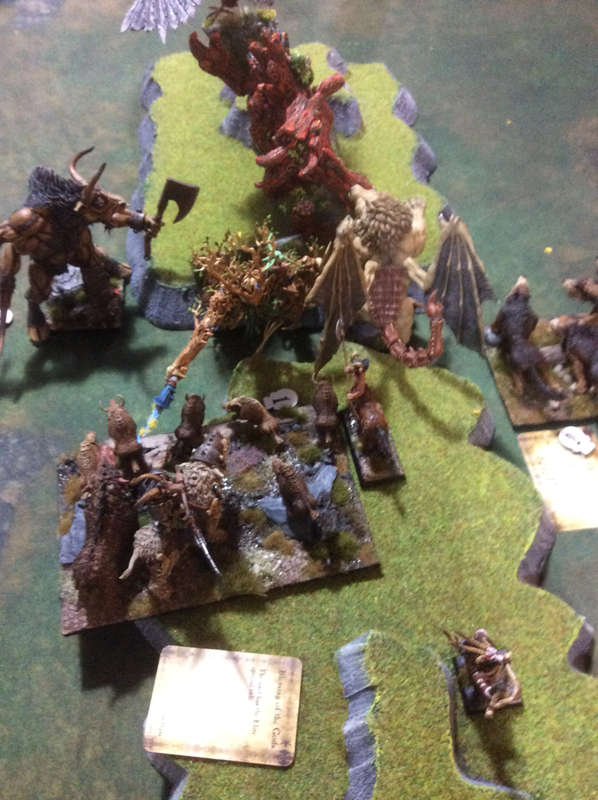 My Lycans hit the Naids and removed them while the Beast Pack sat in front of the Fire Elementals. 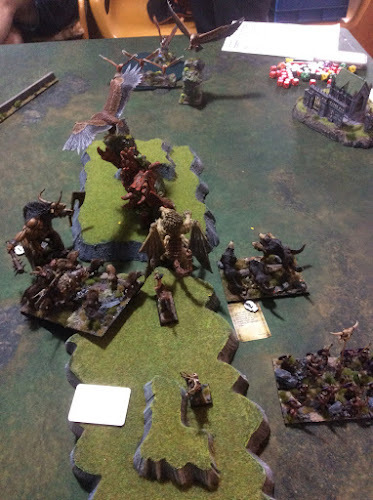 The Spirtwalkers (Bane Chanted) and the Chimera charged the second Shamblers destroying them. This left the Fire Elementals alone on this side of the table with the Spiritwalkers and Lycans threatening and their options limited by the pinning Beast Pack. The Chimera turned to face the flank of the Tree Herder. 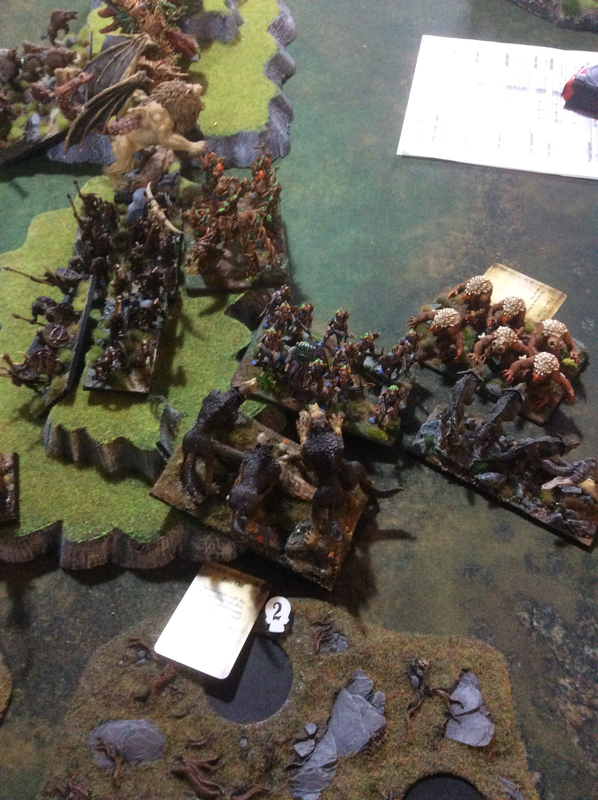 During the turn the Stampede had inflicted 6 wounds on the other Tree Herder. 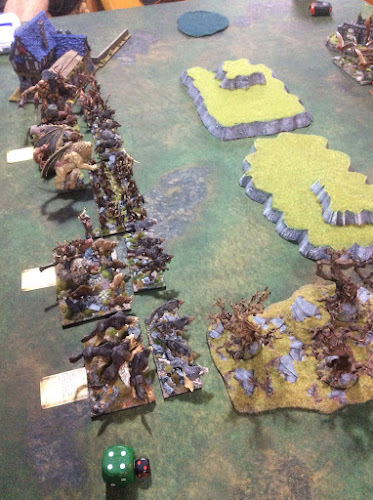 The Fire Elementals charged and routed the Beast Pack allowing them to turn and face the Spiritwalkers and Lycans while the two Tree Herders and BoN charged the Stampede eventually removing it. 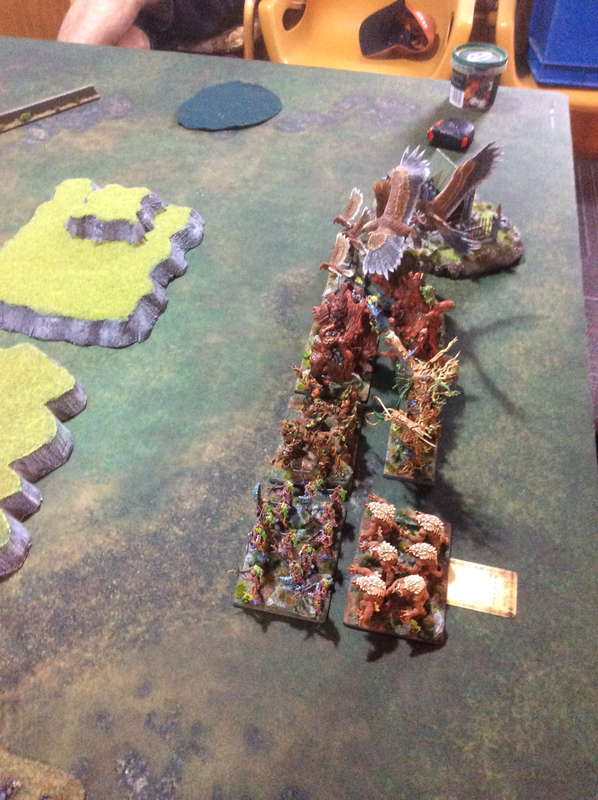 After combat the centreTree Herder turned to face the flanking threat. 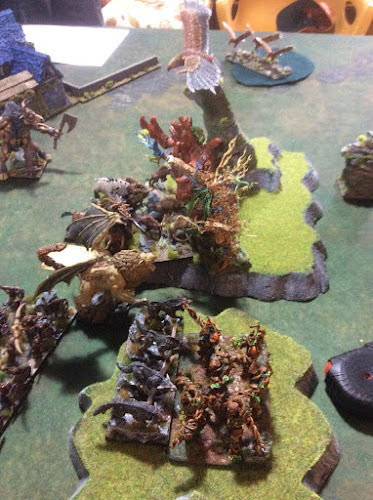 The Chimera was able to use Fly to charge the flank of the other Tree Herder while the Shaman moved to allow the second Stampede to charge the front of the centre Tree Herder. The Lycans moved past the front of the Spiritwalkers who were then able to charge the Fire Elementals. 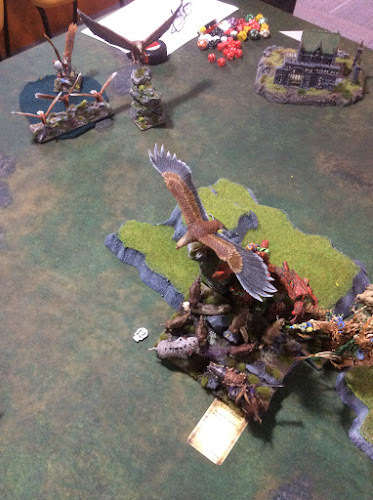 The Spiritwalkers with their 35 Bane Chanted attacks went routed the Elementals (some very nice Owlbears with fiery claws and beaks). 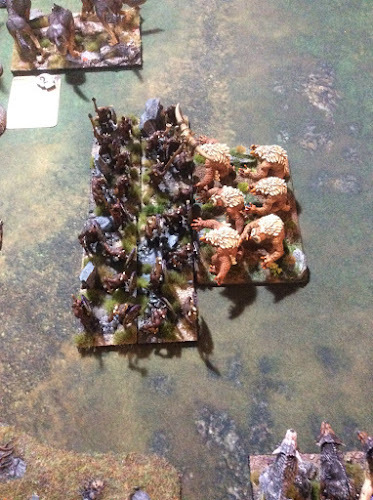 The hills tend to interfere with the placement but the Brutox charged the Herder in the flank while the Stampede went into the front. As mentioned above the Chimera hit the flank of the other Herder. 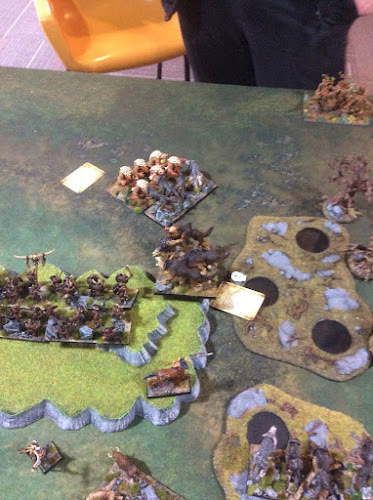 The combined attack routed the first Herder while the second eventually went down to the Chimera supported by the Brutox (see below). 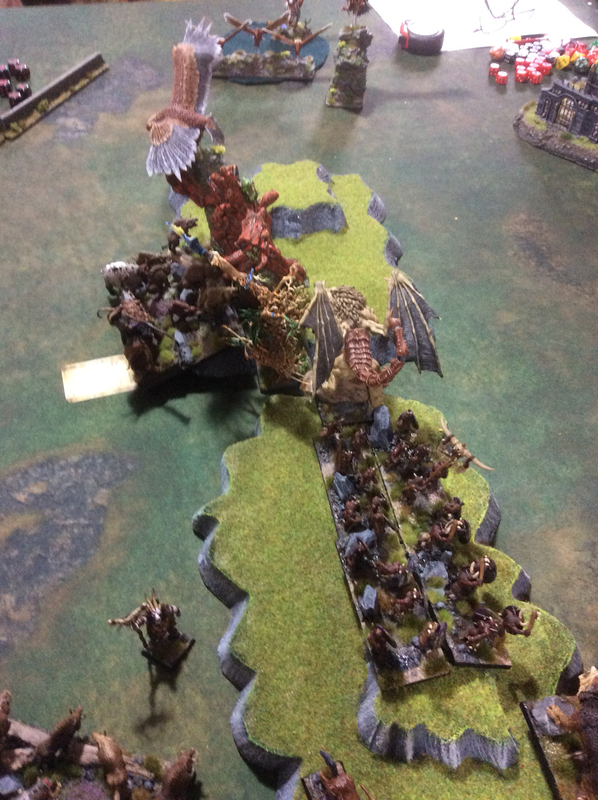 At this point Carson flew the two BoN, the Unicorn and the Sylph Talonriders into my far corner (behind the tavern) and I lacked the ranged ability to get him. I was able to move all my army into his half over the next two turns. 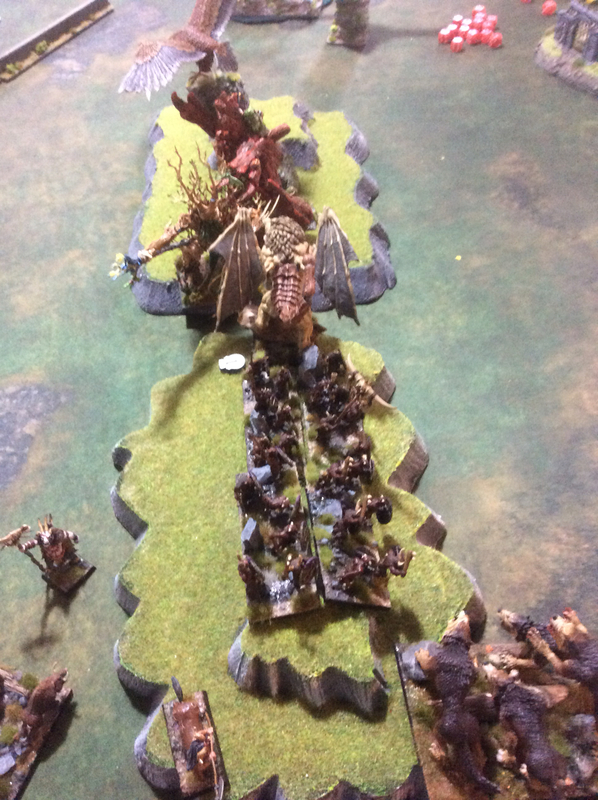 In the end I got approximately 1375 points into his half while he had 725 points in mine. This gave me a 650 point win. I think pretty much everything went right for me in this game. I got the matchups right, was able to screen properly and made combined charges where available. 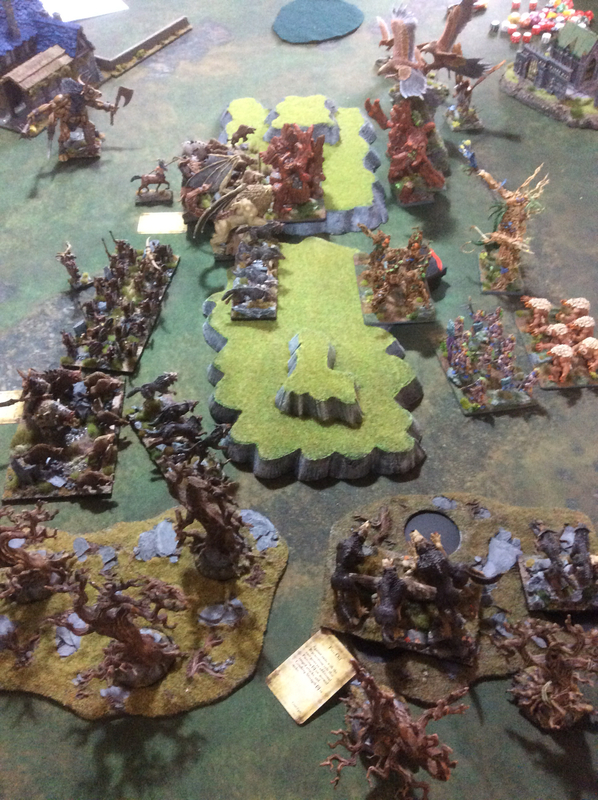 Carson's army suffered from a lack of chaff units to break up my attack and we spoke afterwards about perhaps increasing his drops by swapping out one of his current units for 2-3 chaff units. Very fun game and nice to play Forces of Nature for the first time. I managed to get a second game in so check back latter for that report.